I can picture it now: the bright yellow box of pancake mix, the tall, translucent pitcher filled with lumpy batter, the squeezable plastic bottle of something vaguely resembling maple syrup (already sticky with congealed sugar). These were the ingredients of a special treat. Pancakes for dinner! This meal was so surprising. “Wait… pancakes for WHAT?! For dinner?! !” Whenever my parents resorted to it, the meal always had the air of mischief about it. Without fully realizing it until now, I’ve been trying to reclaim a healthier version of that pancake paradise in my adult life. My husband and I usually only eat a full sit-down breakfast together when we have guests, but we do, every couple of months, have pancakes for dinner. When this happens, I try to make a healthier option. Usually I’ve made oatmeal pancakes and buckwheat pancakes. My parents and siblings seem to be on the same journey. My parents now tend to opt for Belgian waffles made with ricotta cheese, so there’s some protein in the mix. My sister makes thick, protein-packed German pancakes, apple-ring pancakes, and–most recently–British “flapjacks” (which she says are really more like oat bars). Last night, I tried a new take on this. 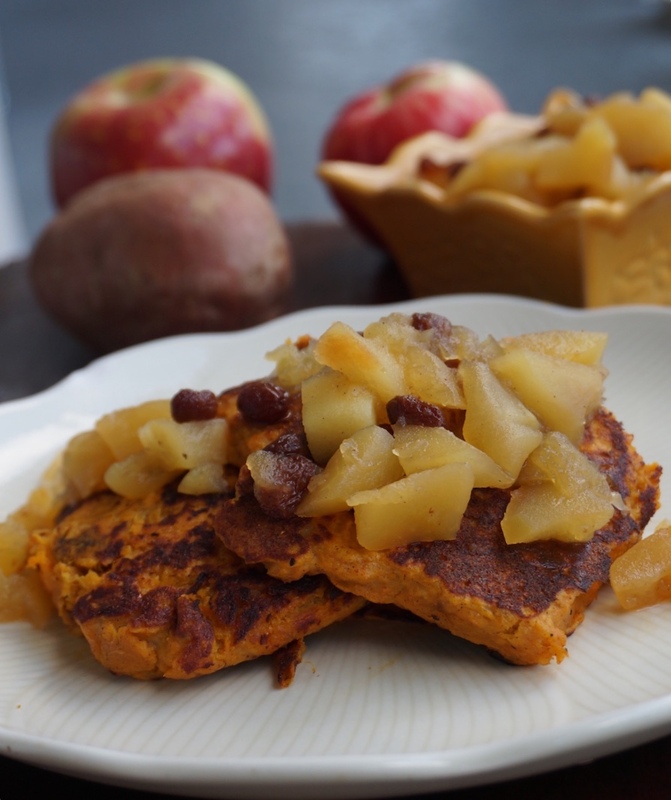 Sweet potato pancakes with apple compote. The combination is blissful–and classic. In fact, I once found a recipe combining roasted apples and sweet potatoes in a cookbook from 1911! These sweet potato pancakes are more like fritters because they are so thick. And good news for those in search of easy, healthy dinners: they are just sweet potato, egg and spices. That makes them gluten-free and packed with nutrients. The compote is sweet, nicely spiced and easy to make–the kind of thing you can make one afternoon, stick in the fridge and forget you even made it (until it’s time to enjoy it!). Roast potatoes without peeling, and it will be easy to remove the skins once the potatoes have cooled. Place scrubbed, quartered sweet potatoes in a casserole dish and drizzle with olive oil. Roast for 45 minutes, stirring halfway through, until potatoes are soft and browned. Remove from oven and let cool. Meanwhile, combine all compote ingredients in a large saucepan. Bring to a boil. Reduce heat to medium low and simmer about 20 minutes until apples can be easily mashed. Mash them slightly, so that they soften but some of the shapes are distinct. Set aside. When potatoes are cool enough to handle, slip the skins off and transfer the inside of the potato to a bowl. Mash the potatoes (you can leave some chunks if you'd like). Mix in eggs and spices. Heat an oiled skillet over medium-high heat. Spoon mashed potatoes onto the skillet in a pancake shape. Cook each one for 5 minutes, then flip with a spatula and heat other side for 3 minutes. Transfer to a plate and keep warm. Top the pancakes/fritters with apple compote.